Africa Animals Birds Cameroon Bird stamps from Cameroon. 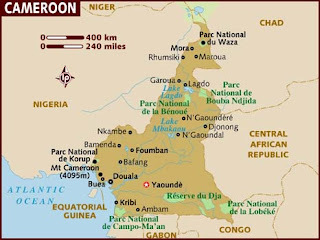 Cameroon is a country in west Central Africa. It is bordered by Nigeria to the west; Chad to the northeast; the Central African Republic to the east; and Equatorial Guinea, Gabon, and the Republic of the Congo to the south. Cameroon's coastline lies on the Bight of Bonny, part of the Gulf of Guinea and the Atlantic Ocean. The country is called "Africa in miniature" for its geological and cultural diversity. Natural features include beaches, deserts, mountains, rainforests, and savannas. The highest point is Mount Cameroon in the southwest, and the largest cities are Douala, Yaoundé and Garoua. Cameroon is home to over 200 different linguistic groups. The country is well known for its native styles of music, particularly makossa and bikutsi, and for its successful national football team. French and English are the official languages. Early inhabitants of the territory included the Sao civilisation around Lake Chad and the Baka hunter-gatherers in the southeastern rainforest. Portuguese explorers reached the coast in the 15th century and named the area Rio dos Camarões, the name from which Cameroon derives. Fulani soldiers founded the Adamawa Emirate in the north in the 19th century, and various ethnic groups of the west and northwest established powerful chiefdoms and fondoms. Cameroon became a German colony in 1884. After World War I, the territory was divided between France and Britain as League of Nations mandates. 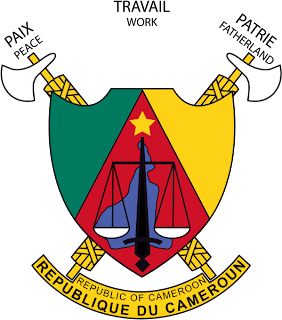 The Union des Populations du Cameroun (UPC) political party advocated independence, but was outlawed by France in the 1950s. It waged war on French and UPC militant forces until 1971. In 1960, the French-administered part of Cameroon became independent as the Republic of Cameroun under President Ahmadou Ahidjo. The southern part of British Cameroons merged with it in 1961 to form the Federal Republic of Cameroon. The country was renamed the United Republic of Cameroon in 1972 and the Republic of Cameroon in 1984. Compared to other African countries, Cameroon enjoys relatively high political and social stability. This has permitted the development of agriculture, roads, railways, and large petroleum and timber industries. Nevertheless, large numbers of Cameroonians live in poverty as subsistence farmers. Power lies firmly in the hands of the authoritarian president since 1982, Paul Biya, and his Cameroon People's Democratic Movement party. The English-speaking territories of Cameroon have grown increasingly alienated from the government, and politicians from those regions have called for greater decentralization and even secession (for example: the Southern Cameroons National Council) of the former British-governed territories.